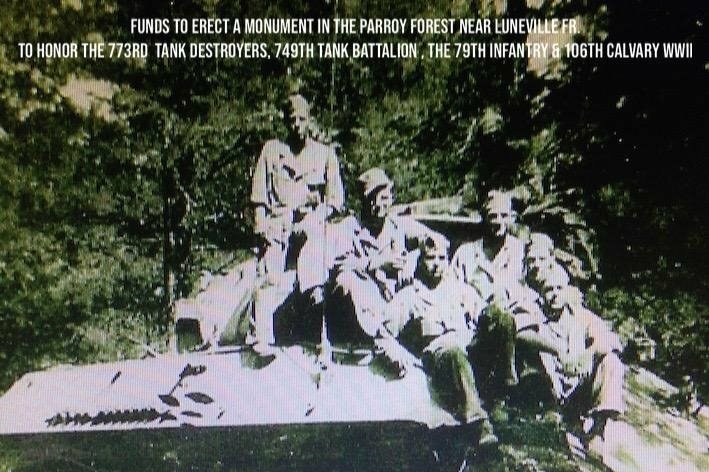 We are in the process of raising funds to erect a monument honoring those who fought in the Parroy Forest, near Lunéville, France during WWII, including the 313th, 314th, and 315th regiments of the 79th Infantry; the 773rd Tank Destroyer Battalion; 749thTD, and the 106th Calvary Unit. The dedication ceremony for this monument will be held on September 14, 2019. The French Government has approved a location for the monument at the main crossroads in the forest. Which was the objective of a major offensive battle by the American forces on October 9th., to clear the Germans from this heavily defended, dense, centuries old forest. Necessary in order to continue pushing towards Berlin & ending the war. The fighting began on September 28, 1944, and the forest was finally cleared by October 13. Many men lost their lives, or were severely wounded during this battle, and our goal is to honor all of them as well as all those brave men who fought. Please donate to help us honor these brave soldiers. All funds raised thru this effort will be used to the creation and installation of the monument. As. Any of you know, it’s a very unusual story of how the 773rd tank destroyers crews history came to light. My father’s tank destroyer took a direct hit on October 9th while advancing towards the crossroads. Some 65 years later, A chance find of an I.D. Bracelet from the forest floor, unearthed after a large storm. Led to so many discoveries and eventually a ceremony in September 2010 at the exact spot where the destroyer was hit.when I came back from France in 2010 I told people I went to France and learned Patriotism. This monument would not be possible without the tireless efforts of the local French people who continue to research and honor the WWII GI.